Home / Articles / Features / Feature Articles / 2017 Victories for Animals! You may recall the horrific video of three animal abusers dragging a shark at high speeds on a motorboat, they laughed as the shark was torn to pieces. 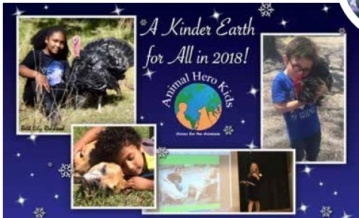 Animal Hero Kids posted a petition asking for felony animal cruelty charge arrests and sent other photographic evidence of wildlife abuse by the perpetrators to officials with the Hillsborough County State Attorney’s Office, local law enforcement and the Florida Fish and Wildlife Commission. We followed through, consistently, with polite requests for updates on the charges which were still not laid even after four months. Now it is with a sense of Victory I am happy to report the serial wildlife abuser, who was able to get off scott-free, prior , was arrested December 12, 2017. Two of the other perpetrators were also arrested with the same animal cruelty felony charges. The Florida Fish and Wildlife Conservation Commission (FWC) and Hillsborough County State Attorney’s Office announced charges against three individuals connected to a video of a shark being dragged behind a boat at high speed. The charges resulted from a four-month long investigation into the video and other disturbing images on social media involving shocking disregard for Florida’s natural resources. "The State Attorney’s Office is committed to holding these men accountable for having engaged in such senseless and unjustifiable animal cruelty," said Andrew H. Warren, State Attorney for the 13th Judicial Circuit. We will keep you updated on their court appearances and what you can do to help ensure these abusers are charged with the utmost sentence which can be up to five years in jail. Thank you to all those who signed our petition, each signature and message were sent to those with the power to lay charges. Victories for Elephants, Tigers Oh My! The “Animal Hero Kids Voices for the Voiceless” book features animal heroes of all ages working to stop the suffering of wildlife used in “entertainment” industries. Since the 1980’s I have been investigating, educating and protesting around captive wildlife shows in circuses. One particular elephant named Nosey held captive by the Liebel family has had documented cases of abuse and neglect, Nosey was tightly chained, confined in her own waste - and one worker stated she was hit with shovels. On December 15 Hugo and Francizka Liebel were arrested on animal cruelty charges. Nosey the elephant is in the custody of the Elephant Sanctuary in Tennessee until the presiding judge issues her decision. This year marks the last year Ringling exploited elephants and tigers in circuses, after 37 years of protest this was a victory. Ringling gave dwindling ticket sales and a public attitude shift as their reason for closing down their exploited captive wildlife show. Multiple Florida dairy farms were cited for cruelty to animals after Animal Rescue Missions’ undercover footage aired on news channels. So many folks have commented to me how horrible the animal abuse was. This victory will cause people to choose non-dairy products. There have never been as many choices in the grocery stores as today with non dairy products. Another victory for farmed animals in 2017 is more celebrities and sports stars choosing a plant based diet for the animals, the planet and their own health. Samuel L Jackson, Leonardo DiCaprio, Russell Brand, John Salley, Brad Pitt, Bill Gates, Venus Williams, DJ Khaled and Snoop Dog have jumped aboard the vegan train. Bill Gates and Leonardo DiCaprio have also invested heavily in vegan food ventures which are now a lucrative, billion dollar business. What Can You Do to Help 2018 Be a Banner Year for Animals? 1-Choose Vegan This is the number one, largest impact choice you can make to benefit other animals. Ninety-seven percent of all animals who suffer and are killed in the United States are factory farmed animals. 2-Adopt Not Shop If there were 8 dogs in every home in the United States there would not be enough homes for the dogs who exist right now. Spay, neuter and adopt are the best choices you can make to help companion animals who are, literally, dying to meet you in shelters. 3-Speak Up to Senators Let your government representatives know when you support legislation helping animals. 4-Support Kindness Education Last but definitely not least, prevent animal cruelty by promoting compassion towards all . AnimalHeroKids.org is definitely the best resource in this area. In 2018 we are determined to gift the “Animal Hero Kids Voices for the Voiceless” book to each school library after presenting interactive, empathy fostering programs.